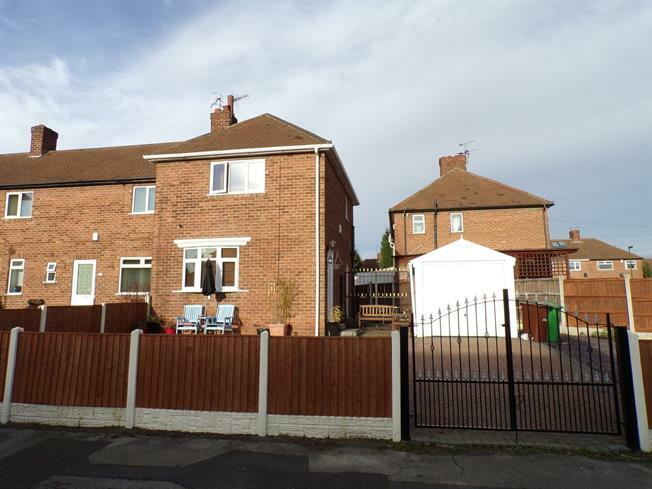 2 Bedroom End of Terrace House For Sale in Nottingham for Guide Price £140,000. Situated on an large corner plot on this quiet residential road this property is the ideal family home. With great potential for extension subject to planning. In brief the accommodation comprises; Entrance Hall, Lounge, Modern Fitted Kitchen with integrated appliances. Upstairs are two double Bedrooms and modern family Bathroom. Externally the property benefits from a block paved driveway, Single Garage, low maintenance front and rear gardens and a detached garage. Double glazed uPVC window facing the rear. Radiator, laminate and tiled flooring, ceiling light. Roll edge work surface, fitted and wall and base units, stainless steel sink, integrated, electric oven, integrated, gas hob, over hob extractor, space for washing machine, fridge/freezer. Double glazed uPVC window with obscure glass facing the rear. Heated towel rail, tiled flooring, ceiling light.